Destined to become Abu Dhabi’s new commercial district Sowwah Island is rapidly taking shape rising up out of the sand of this once deserted downtown island. Developed by Mubadala and masterplanned by world-famous Broadway Malyan Architects this 585,000 square metre mixed-use mega-project includes a 364-bed Cleveland Hospital, an exclusive 34-storey 5-star Rosewood hotel, residential accommodation for 30,000 inhabitants, and a spectacular new HQ for the Abu Dhabi Securities Exchange (seen in the images below) amongst much. 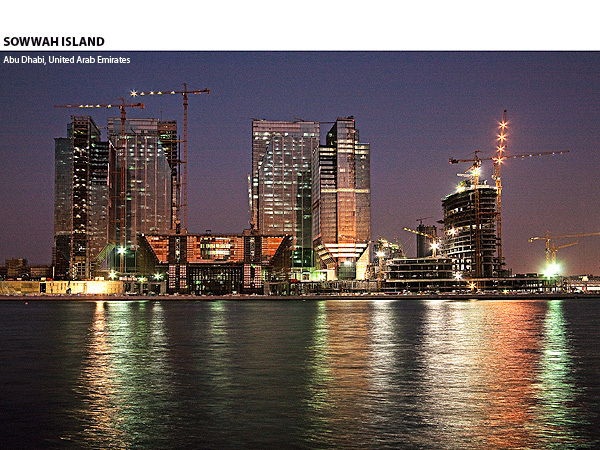 Just another of the many mega-projects shaping the skyline and destiny of Abu Dhabi in the United Arab Emirates. Hi I am desperatly looking for some high resolution images of sowwah square, would you be able to help?